I was in the Liberty Sunset Garden Center indoor plant department in Red Hook, Brooklyn yesterday. It is a botanic garden style indoor plant store right out of the 1970's indoor plant boom era. Many of us remember it as the golden age of houseplants. If you live in the area be sure to visit. I could spend a lot of time (and money) exploring this store. It is a fabulous mini tropical rain forest, evocative of memorable trips in real rain forests. Most of the stores like this from the '70s are long gone, replaced by rather boring big box store plant departments. I will post some photos of the store in the near future. This inexpensive but unique terracotta planter (saucer) from LSGC is now a bonsai planter. Note that there is no de rigueur (but dumb) drain hole. 99% of writers who write about indoor plants on the web shouldn't. The vast majority of them simply don't know what they're talking about. This is one of them. The writer's comments about Ficus trees are amusing, but totally inaccurate. Given adequate light they are one of the toughest plants on the planet. It would also help if people better understood the benefits of sub-irrigated planters (SIPs aka"self-watering"). They make a major difference in the health of whatever plants you grow, whether decorative or edible. One of the significant benefits of SIPs for indoor plants is that when watering stress is removed, plants are better able to tolerate lower light conditions. This was one of the most significant discoveries when we converted to SIPs in my interior plantscaping company back in the '70s. Plants don't like stress any more than we do. A good way to grow Ficus trees. A: If you think Mother Nature is always in vogue, think again. Plants have long come in and out of style, depending on the times. The Victorians, for example, adored exotics like iron plants (Aspidistra elatior) and ferns of all kinds — these were the first things to go when decorator Elsie de Wolfe threw over all things Victorian and invented clean, modern interior design in the late 1800s. Anyone who remembers the 1970s also remembers the notoriously finicky Ficus tree (died if you looked at it). African violets also had their day in the sunlamp, and we're just edging past the age of "Lucky Bamboo." Recycled socks make excellent soda bottle SIP covers ("cloth cachepots"). This one year old Ficus benjamina cost next to nothing. The plant was propagated from cuttings rooted in the same planter about one year ago. The soda bottle SIPs are free and you help the environment. The polished pebbles cost just pennies. There are single socks and socks with holes just waiting for a higher calling in life. This is it! It's their big chance! You can help them. 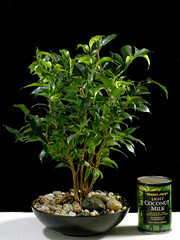 Incidentally, the Ficus is the same houseplant shown in this prior post. 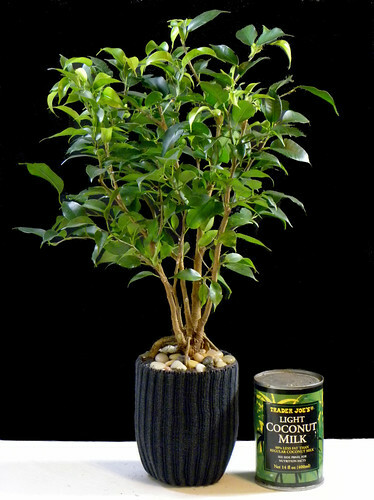 The same plant (right-hand photo) converted to expanded clay pebble hydroculture. I probably haven’t heard all of the lame reasons for growing houseplants in clay or opaque plastic pots but I’ve heard a lot of them over the years. Pretzel logic and ignorance know no bounds. By now, you likely know that I advocate repurposed (recycled) soda/pop bottle planters as clearly (pun intended) the best way to grow houseplants. They are also the best plant science learning aid that I know of. As you can probably tell, these Ficus trees are not on the floor of a greenhouse. Look below after the jump. There are now more than 50 of them growing in the CuGreen plant lab. It is rather amazing to know that these desktop trees were propagated from four small bags of cuttings starting about a year and a half ago. Read the back story here. There is no special equipment here. The light gardens are Inter-Metro type storage racks from Costco and the artificial lighting is supplied from inexpensive shop lights (4’) using ordinary 40-watt fluorescent tubes. The racks are located in east facing windows so they also receive natural light during the day. The planters are made from recycled pop/soda bottles. To encourage rooting they are covered with clear plastic deli containers to start. It typically takes 3-4 weeks to root the cuttings and the deli containers are then removed. These seven Sansevieria plants were propagated using the same system. Who knows how many new plants will be propagated from these plants over the next year or so. I will post the progress. You can see this blue glaze bonsai planter in this post about hydroculture conversion and pipette tubes. It is a typical bonsai planter with a drain hole that I plugged. 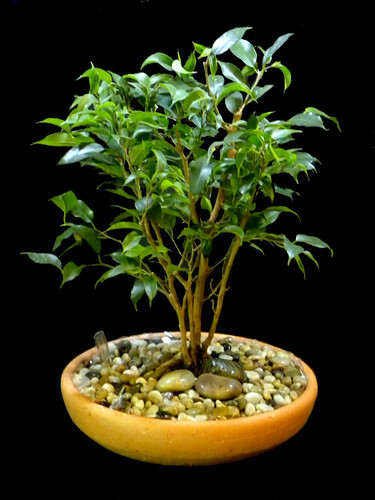 The tabletop Ficus benjamina thrives in the hydroculture (clay pebble) environment. Note the black pebble ground cover. This is not a plant maintenance problem because there is no need for finger poking to check soil moisture. The water level is checked with a pipette. Given adequate light anyone can care for this plant. No green thumb is required. Both soil sub-irrigation and clay pebble hydroculture (a form of sub-irrigation) allow the creation of more visually pleasing plantings that include ground cover decoration. This could be a combination of polished stones and a vining plant such as Ficus pumila (Creeping Fig). Instead of a just a plant in a pot on your desktop, you can be looking at a landscape that connects to the natural world. 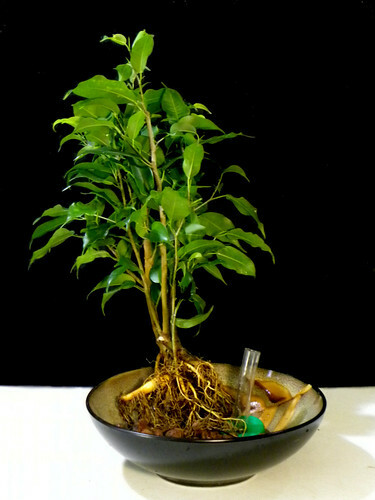 These archive photos document the conversion of a Ficus benjamina to clay pebble hydroculture back in 2006. The tree had been growing in a Jardinier sub-irrigation (aka self-watering) planter. I used a full force jet of water from a hose nozzle to remove the soil mix. I then pruned the root system so that the tree would fit into the homemade sub-irrigation planter on the right. This took no more than ten minutes. The tree never dropped a leaf. Tell me about temperamental Ficus trees. These plants are tough and have very strong root systems if maintained properly. I have done this many times. As you gain experience from washing the soil from other plant species, you will discover which have tough wiry roots and which are more tender. I would not do the full-force hose jet process on all plants. My advice is to just do it! It's easy to learn. The root systems of plants are not as super-sensitive as many would lead you to believe. This video taken of the plant wall installation at the Dodge Foundation headquarters shows a similar process. If you have doubts, the video should help to dispel them. 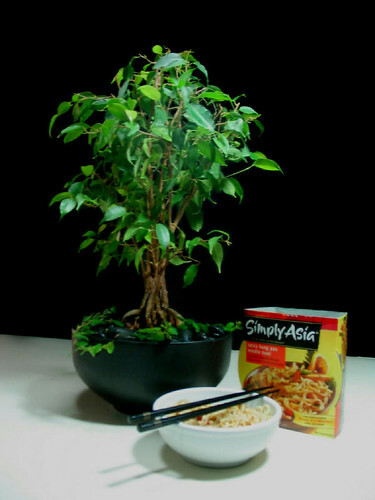 Some of the most knowledgeable people about indoor Ficus trees are bonsai practitioners. One of them is Jerry Meislik author and webmaster of the BonsaiHunk. 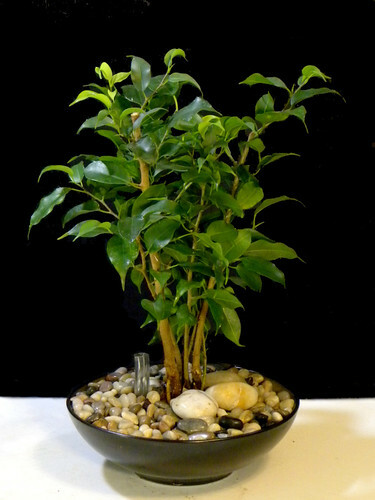 All of his website is worth exploring but The Ficus Forum is of particular value to those of us with an interest in tabletop Ficus trees as indoor plants. I've grown tabletop Ficus trees that are similar to the one at the top, but the styling of the tree in the lower photo is a level above me. It's on a long list of things to learn. 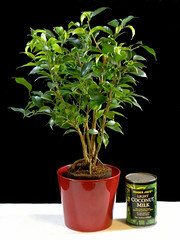 Weeping Fig (Ficus benjamina) trees are very popular indoor plants. Although a sub-tropical plant, Ficus are the only small leaf trees that are evocative of northern climate trees. To clarify the common name Weeping Fig, it’s not because they “weep” their leaves. This weeping refers to the graceful drooping growth habit of the branches. 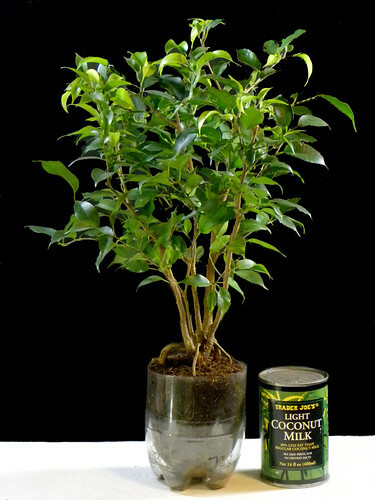 Ficus benjamina trees are uber-tough plants. I know this from long experience in the interior plantscaping business. In addition to maintaining them in accounts we grew them on from tissue culture starter plants in our power line nursery. They are without question my favorite indoor plant. The undeserved reputation they have among houseplant hobbyists is most likely due to insufficient light. It’s very typical for a homeowner to locate them in a bare corner too far away from adequate light. Unfortunately, few understand the need for and benefit of measuring light with a foot-candle (or Lux) light meter. Using window direction is vague and imprecise, particularly for someone who is not a dedicated houseplant or gardening hobbyist. That, by the way, describes the vast majority of us. Here are some tips to avoid falling Ficus leaves.